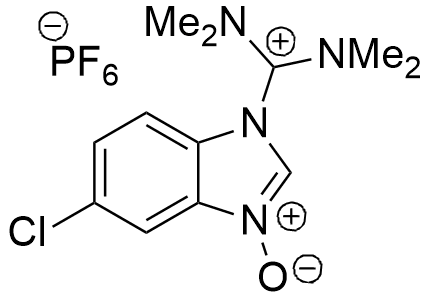 HCTU is an aminium-based coupling reagent, analogous to HBTU, which in comparative studies was found to give superior results to TBTU in the synthesis of difficult peptides, in hindered couplings, and cyclizations. HCTU is a highly efficient coupling reagent that could be used as a low-cost alternative to more expensive, highly efficient reagents such as HATU when fast coupling times (5 min or less) are desired. Fast coupling times promote increased productivity, and in some cases may also result in purer crude peptides by not allowing kinetically slower side reactions to compete. C. A. Chantell, M. A. Onaiyekan, M. Menakuru J. Pept. Sci., 2012, 18, 88–91. C. A. Hood, G. Fuentes, H. Patel, K. Page, M. Menakuru, and J. H. Park J. Pept. Sci., 2008, 14, 97–101. O. Marder, Y. Shvo, and F. Albericio Chemistry Today, 2002, 20 (7/8), 37-41.